The dual-core processors will run at 500-800mhz. But the kicker is the price. Tran says that phones made from the BCM2157 chipset will retail for under $100 and may dip as low as $75. Those devices should debut in just 3-6 months (and we might hear about them next month at CES)…. To be clear, That sub $100 price is not the cost of materials, it is the suggested retail price after the manufacturers (and carriers) have taken their profits. via 2011 will be the year Android explodes – Google 24/7 – Fortune Tech. 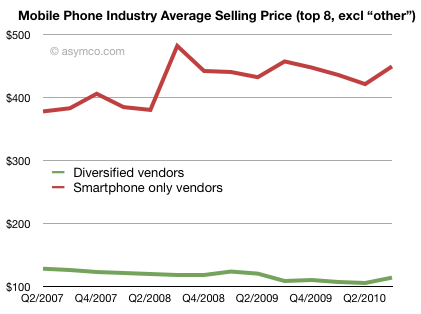 My own data shows that the average selling price for the top eight phone vendors for Q3 of 2010 was $156. Smartphone-only vendors were charging $450 on average and diversified vendors selling both smart and non-smart phones were charging $144 on average. Nokia’s ASP for its entire line-up was $88 (spread over about 84 million non-smart and 26.5 million smartphones). What strikes me about the claim from Broadcom is that a $100 retail price for a smartphone implies an ASP of about $85 or so (assuming $15 or a very modest 18% channel mark-up). That means that a smartphone could be built using this chip which would have nearly half the average price of all branded phones sold last quarter. And this type of phone could be available not in three years in three months. The chart above shows how prices could collapse. Of course, low price is not the only condition for the widespread substitution of smart devices in vendor portfolios. But it does take away a significant objection. It no longer seems far-fetched to say that in another two years the price points for smartphones will be low enough to make them marketable in all markets. This may in fact be true next year. I suspect that non-branded vendors will lead the way and make these devices widely available in emerging markets. The question will then be entirely up to the branded vendors whether they will follow or will they try to market dumb phones vs. smart phones at similar price points. Will buyers opt for a branded device with no ecosystem or unbranded device with the Android ecosystem? It becomes harder to envision any reason why non-smart devices will earn positions in portfolios two years from now. Note that I’m not suggesting that the market for high-end smartphones is threatened yet–there is still a lot of innovation that still needs to happen to shape that market into one of mobile computing (vs. mobile phoning). Instead, what I am suggesting is that the bottom of the phone market is very vulnerable to becoming smart. This may sound like an odd sort of disruption, but it’s a very sinister threat to companies who are in the business of selling brands and not platforms.